Hi! I'm Sandra Lee, and if you love dolls like I do, my doll care products are for you!. If you collect old dolls or WANT to, or have just one old composition doll that belonged to your Grandmother -- I can help you! I ADORE old dolls -- especially the ones made from the 1910s to the 1940s -- Shirley Temple, Patsy, and the big baby dolls with soft bodies that you can really hug! They were made of a material called composition -- basically a mixture of wood-pulp (like sawdust) and glue. It was originally meant to be "unbreakable", but time has not been very kind to these dolls. We must shell out a small fortune for a perfect example of these dolls (up to $1200 or more!!). The rest -- bargains if you could just fix them -- are now CRAZED. CRAZING is a fine network of cracks that develops over time, just like wrinkles on humans (sigh...). The dolls "skin", or paint layer, has far less elasticity than our own. When the climate is too damp or too dry, the doll's "skin" tries to expand or contract and ends up cracking or CRAZING. CRAZING has always been a big source of frustration to collectors. Restoration can mean hundreds of dollars and a long waiting list for a good restorer. Or a bad job of restoration? A nightmare! The doll ruined, its value plummeting to nothing! This was not the answer for me. Until now, there were no suitable products to solve the crazing problem without expensive restoration. So I took matters into my own hands! After years of testing, I developed COMPO CRAZE CONCEALER. COMPO CRAZE CONCEALER is a safe, inexpensive and easy way to cosmetically enhance old composition dolls. It works by concealing the craze lines. And, best of all -- it maintains their important original condition and usually increases their value, too! Bring an old doll back to life! Since I no longer have the time necessary for Sandra Lee Product, I have decided to go ahead and join my husband in his retirement full time. And I have now turned the daily operations of Sandra Lee Product over to my two daughters, Tonja and Elisa (both pictured below between my boys, Elisa is on the left and Tonja is to the right of her) . If you ever purchased products from us at a doll show you most likely met one or both of them. They have both been involved with Sandra Lee Products since the beginning, and are both very knowledgeable about our products and their uses. We will continue to offer all the doll products you have come to know and love. I will remain the owner of Sandra Lee Products, but I will not handle the every day business of running it. 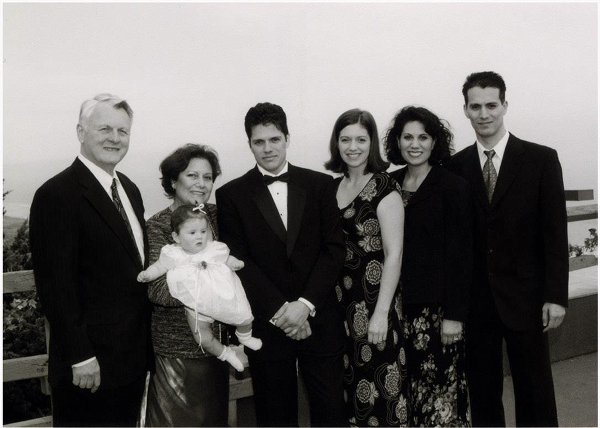 Here is a picture of my husband and I with 4 of my 6 children, and one of my grandchildren, at my oldest son's wedding.